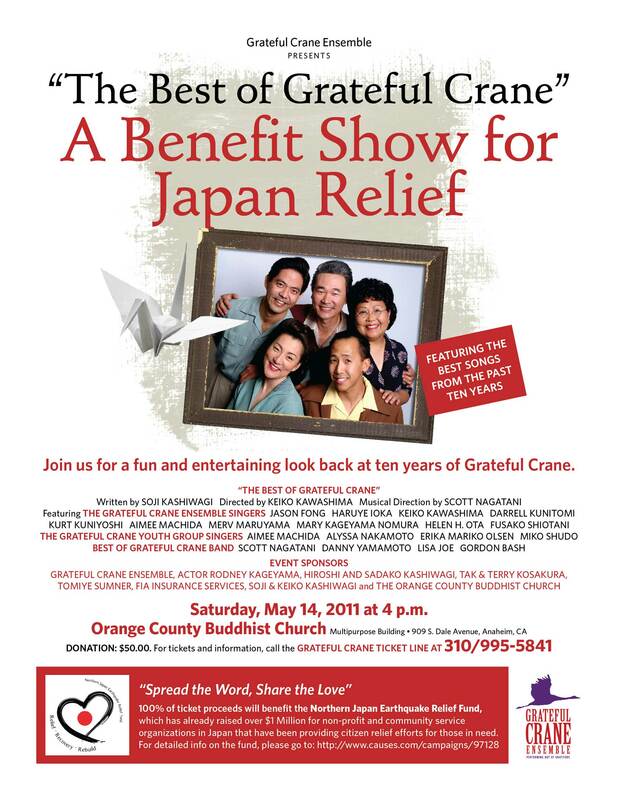 “The Best of Grateful Crane, A Benefit Show for Japan Relief,” will be performed on Saturday, May 14 at 4 p.m. at the Orange County Buddhist Church, Multipurpose Building, in Anaheim. Presented by the Grateful Crane Ensemble, the two-act show will feature the best songs the Ensemble has sung over the past ten years of the group’s existence. Japanese and American favorites such as “Koko ni Sachi Ari,” “Kawa no Nagare no Youni,” “Moonlight Serenade,” “Star Dust,” and “I’ll Be Seeing You,” will be featured. 100 % of ticket proceeds will be donated to the Northern Japan Earthquake Relief Fund, which is being run by the Japanese Cultural and Community Center of Northern California (JCCCNC). The JCCCNC, based in San Francisco, has raised over $1 million that has gone to direct relief to people in areas of Japan with the greatest needs. In selecting a fund, Kashiwagi explained that he was well aware of some concerns expressed over larger relief funds that reportedly take out high administrative fees from public donations. In his research, he looked for a fund that would deliver 100% of donations directly to people in need in Japan, and one that was rooted in the Japanese American community. He found both in the JCCCNC. During the Kobe quake, the JCCCNC raised $600,000 in direct relief for earthquake victims. For the past 16 years, the Center has maintained its relationships with its contacts in Kobe so when the March 11th quake/tsunami hit, it was able to set up its new fund on the same day, and immediately started taking donations. According to an update, dated March 28th, on the JCCCNC website, donations have already been put to work in Japan including the delivery of food, water, batteries and flashlights to the Tohoku region of Japan; establishing and sustaining two relief shelters and three childcare centers in Sendai City and Matsushima Azuma in Miyagi Prefecture; and supporting the resettlement of over 20,000 homeless evacuees from the Tohoku region to resettle in temporary housing in Kobe, Japan, to name a few. Benefit show sponsors include the Grateful Crane Ensemble, actor Rodney Kageyama, Hiroshi and Sadako Kashiwagi, Tak & Terry Kosakura, Tomiye Sumner, FIA Insurance Services, Soji & Keiko Kashiwagi and the Orange County Buddhist Church. “The Best of Grateful Crane” show will feature the singing of Jason Fong, Haruye Ioka, Keiko Kawashima, Darrell Kunitomi, Kurt Kuniyoshi, Aimee Machida, Merv Maruyama, Mary Kageyama Nomura, Helen H. Ota and Fusako Shiotani. The newly formed Grateful Crane Youth Singers will also perform. The group includes Aimee Machida, Alyssa Nakamoto, Erika Mariko Olsen and Miko Shudo. The “Best of Grateful Crane” band includes Scott Nagatani, Danny Yamamoto, Lisa Joe and Gordon Bash. A donation of $50.00 per person is requested for this special benefit show. The Orange County Buddhist Church is located at 909 S. Dale Avenue in Anaheim. Free parking is available. For tickets and information, call the Grateful Crane ticket line at (310) 995-5841.